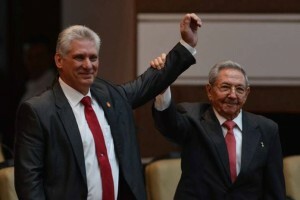 HAVANA - Miguel Diaz-Canel Bermudez was elected president of Cuba on Wednesday during a session of the National Assembly of People’s Power (ANPP). Alina Balseiro Gutiérrez, president of the National Electoral Commission (CEN), at the Havana Convention Center, announced the results of the vote on the 604 ballots cast, when 99.83 of the valid votes were cast for the election of Díaz-Canel Bermúdez. It was noted that the wishes of outgoing president, Raúl Castro Ruz, were taken into account, who in the last session of the ANPP, in December, reiterated that when the new legislature of the ANPP was constituted, he would conclude his second and last mandate as head of the councils of state and ministers. Balseiro Gutiérrez also said that Salvador Valdés Mesa was elected first vice president. In the 31-member elected state body, there are 15 women, 11 new members and 12 were ratified. Belonging to the generation born after the revolution, Díaz-Canel, an electronics engineer with a master’s in management, has been a member of the political bureau of the Communist Party since 2003. His work as a student leader stands out, when he became the first secretary of the Provincial Committee of the Young Communist League in Villa Clara and second secretary in the national leadership. He has vast experience in political leadership in the party; promoted since 1993 he became a member of the provincial bureau in Villa Clara, serving as the first secretary in that territory and later in Holguín. He was appointed minister of higher education in 2009, vice president of the council of ministers in 2012 and elected first vice president of the council of state a year later.